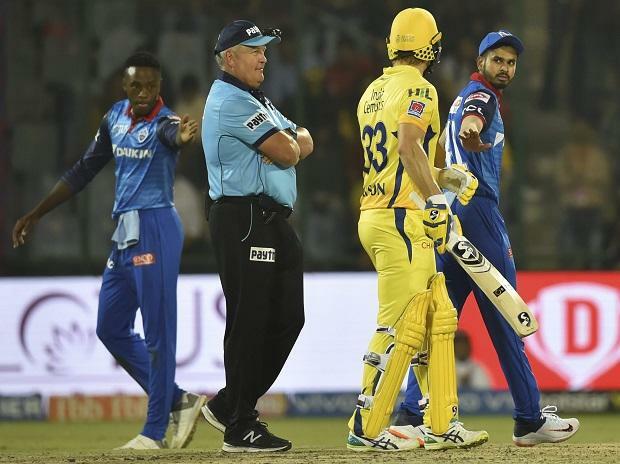 In Match 5 of VIVO Indian Premier League 2019 (IPL 2019), Chennai Super Kings (CSK) beat Delhi Capitals (DC) by 6 wickets in a last over thriller at Ferozshah Kotla ground in New Delhi on Tuesday. In the last over when CSK needed 2 runs, Kasigo Rabada bowled brilliantly as he took the wicket of Kedar Jadhav off the first ball while bowled two successive DOT balls to Dwayne Bravo before the batsman hit the winning run with two balls to spare. Earlier, Shikhar Dhawan scored a painstaking half-century in Delhi Capitals' sub-par 147 for 6 against Chennai Super Kings on a lifeless Kotla track in an IPL encounter here Tuesday. The senior opener once again played the role of sheet anchor in his 51 off 47 balls that had seven boundaries but unfortunately failed to accelerate during the final overs. This left the home team at least 30 runs short of a fighting score. From a comfortable 120 for 2 with the dangerous Rishabh Pant at the crease, CSK seized the momentum, effecting a middle-order collapse. Capitals lost four wickets for seven runs in just 1.5 overs. From 118 for 2 after 15 overs, the last five overs yielded only 29 runs. With the ball stopping and coming, Capitals batsmen found Dwayne Bravo's (3/33 in 4 overs) variations difficult to handle. Ravindra Jadeja (1/23 in 4 overs) also made life difficult for the Capitals in the middle overs and Harbhajan Singh (0/30 in 4 overs) also bowled as many as 10 dot balls. Dhawan, however, continued to hold one end up and hit the occasional boundary in between, even as stroke making became increasingly difficult. Pant (25 off 12 balls), during his 41-run stand with Dhawan, tried to negate the pitch factor but did not last till the death overs. He did reach out to a short ball from Harbhajan, dispatching it over long off for a six. In the next over, his short arm pull off Dwayne Bravo was taken by Shardul Thakur at deep square leg boundary. With Colin Ingram (2) and Keemo Paul (0) also being dismissed cheaply, followed by Dhawan, the expectations of a 175-plus total withered away.